Her bollywood career is already glittering and will get into style mode with upcoming movie 'Fashion'. 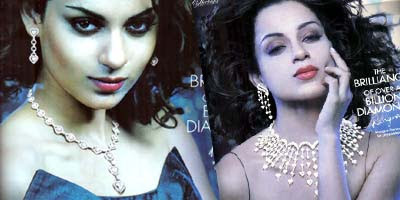 Kangana is seen more in different advertisement campaigns. Here is another one with all the glitter and dazzle of jewels. Checkout Kangana Ranaut posting for awesome Joyalukkas Jewels. She for sure is doing justice to the advertisement shots, what say?